The head of the Polish MoD, Mariusz Błaszczak, issued a recommendation addressed to the Chief of General Staff to accelerate the new generation fighter aircraft programme. This is to lead towards speeded-up introduction of a successor of the MiG-29 and Su-22 fast jets in the Polish Air Force. The Polish Ministry of Defence probably referred to the Harpia [Harpy Eagle] new fighter aircraft programme. The analytical work concerning the multi-role new generation aircraft began towards the end of last year. Two tasks have been defined, within the framework of the Harpia programme. Four of the listed companies - Saab, Lockheed Martin, Leonardo and Boeing - are international companies manufacturing multi-role fighter aircraft. Fights-On Logistics, on the other hand, was working in the area of introducing the F-16 jets in Poland, when they have been acquired. Now it offers services that are related to introduction and support of operations of the fighter aircraft. Details of the offer have not been disclosed now. We know that Saab may offer Gripens (in the NG variant), Lockheed Martin may propose the F-16 and/or F-35 platforms, while Boeing may offer its F-15 or F/A-18 designs, and Leonardo is primarily offering the Eurofighter Typhoon. M-346FA Masters have also been promoted as a potential Su-22 replacement. Meanwhile, market analysis with regards to the “Capability of carrying out electronic jamming from the air” involves the following entities: Saab AB, Elbit Systems EW and SIGINT - Elisra Ltd., Griffin along with Elta Systems Ltd. The MoD’s declaration related to acceleration of the Harpia programme has been issued in parallel with information concerning the Armed Forces’ Development Programme, concerning the period until the year 2026. This is the last step preceding the issuance of the Technical Modernization Plan covering the very same period and making it possible to conclude agreements, with payments scheduled to happen within that period. Thus, it may be assumed that Harpia platform [Harpy Eagle] is going to be introduced during this programme's period of validity. The Ministry also referred to the information concerning the investigation regarding the causes of the MiG-29 crash that happened back in July. There are some reports being circulated, concerning possible ejection seat malfunction during that event. Let us recall that, following the July crash, the flying operations of both the Su-22 as well as the MiG-29 have been suspended. Fitters went back in the air in late September, and Fulcrums got back flying in early-November. The Ministry of Defence assured that the head of the KBWLLP military aircraft incident investigation body works closely together with the Warsaw District Prosecutor and with the General Commander of the Armed Forces. Furthermore, the Commission ordered execution of numerous analytical works to be carried out. The work was delegated, for instance, to the Military Institute of Armament Technology with regards to the ejection seat explosive charges, or to the Air Force Institute of Technology, with regards to operation of the fuel system. During the investigation, the Commission asked the WZL No. 2 and No. 4 plants (Military Aviation Works) to share information. Collaboration with the listed bodies has been going on without any interruption. As a result of the research carried out, the Commission handed off recommendations concerning the initial diagnostics concerning the ejection seat in August this year; also, in October this year, information was provided concerning the operation of the fuel system, on the basis of which the General Commander made a decision to bring the MiG-29 and Su-22 aircraft back to flying. The MoD admitted that it will only be possible to define the reasons for the MiG-29 crash after the investigation is finalized. “Any statements suggesting that the information on the crash is being hidden or artificially made confidential are unjustified. Only after the work made by the Commission and by the Prosecutor comes to an end will it be possible to definitively come to a conclusion, with regards to the causes of the MiG-29 crash”. MiG-29’s (30 in service) and Su-22’s (18 in service) are to be replaced by the new aircraft. To replace them one-for-one, it would be required to procure around 48 jets. We know, however, that the Air Force is willing to acquire up to 64 Harpia platforms. It is not a secret that operational use of the legacy fighter aircraft is becoming increasingly more difficult. On the other hand, as stated during the “Polish Aviation Centenary. Prospects of Development” conference, by Brig. 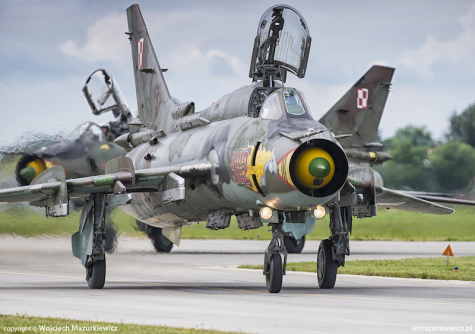 General Jacek Pszczoła, Air Force Inspector of the General Command of the Armed Forces, no sudden withdrawal shall take place, before the Harpia system is introduced, to maintain the flying proficiency. “The situation, when it comes to the post-Soviet hardware, is not optimistic. Voices can be heard that following the Malbork crash it may be a good time to resign from those jets and think about Harpia. [...] My stance is that as long as those jets are available, I want to maintain the bases in Malbork, Świdwin and Minsk Mazowiecki in operation. If I resign from those aircraft and from that personnel, recovery of that potential would take a decade or even more,” said Brig. general. pil. Jacek Pszczoła, Air Force Inspector, General Command of the Armed Forces. In his recent response to a parliamentary question, Deputy Head of the Polish Ministry of Defence, Wojciech Skurkiewicz, said that financing of the Harpia programme is scheduled to start from 2020 which means that an agreement shall be signed by then, with delivery of new platforms to begin as of 2024. This schedule is quite ambitious, considering the convoluted nature of the programme. This would mean that starting from finalization of the analytical-conceptual phase, until the moment when the contract is signed, less than 2 years should elapse. Considering the other programmes, and the way progress is made within them, this will be hard to be achieved. For the sake of comparison, in case of the Wisła programme, the conceptual analyses have been finalized in 2014, with contracts being signed in March this year. Partial introduction of the existing platforms already operated by the Air Force (F-16V or M-346FA) could be a potential means accelerating the introduction of a new aircraft. Introduction of such jets would be somewhat easier from the point of view of training and creation of operational support system that has been, at least partially, embedded in the structure of the Armed Forces as for now. The MoD also stresses the fact that the new aircraft shall be capable of working in a A2/AD and net-centric setting, and it shall also elevate the quality in air/battle support operations to a whole different level. Thus, the aircraft should be capable of SEAD tasks and of working in area-denial conditions. It should also be able to work directly with the allies, within the framework of the joint, new generation command systems. The new generation MRCA programme has been one of the priorities of the Strategic Defence Review and its public version, Poland’s Defence Concept.